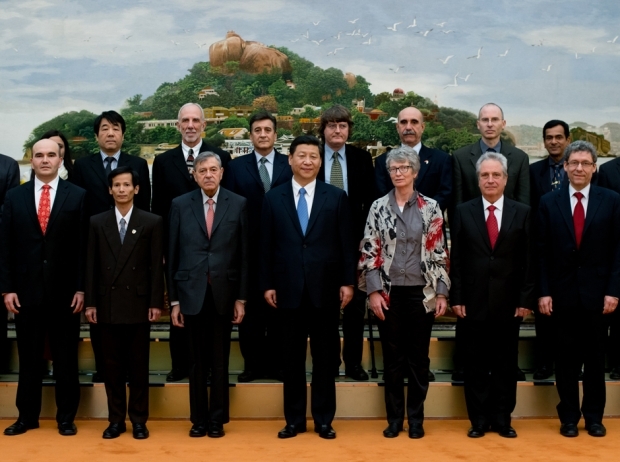 China's newly appointed leader Xi Jinping (front C) stands with ‘foreign experts’ (top L-R) Bushra Naz, Tokuchi Tatsuhito, Jon Michael Davis, Guillermo Gonzalez, Spurzem Rainer Heinz Willhelm, Rolando Perez Rodrigue, David Waxman, Santos Madhava Warrier, (front L-R) Cyrille Charles Louis Breard, Eddy Prabowo, Pedro Nueno Iniesta, Katharina Kohse-Hoinghaus, Atanas Blagov Stoyanov, and Jean Dorey as they attend a meeting at the Great Hall of the People on December 5, 2012 in Beijing, China. By Tokuchi Tatsuhito. This story was originally published at Caixin on December 19, 2012. I was informed in late November that the State Administration of Foreign Experts Affairs (SAFEA) had invited me to a whole-day meeting in Beijing to discuss my impressions of the 18th National Party Congress and give advice to the Chinese government. I had no idea the meeting would include Xi Jinping, the party’s new general secretary. I didn’t spend much time preparing my talking points for the SAFEA meeting; I just wanted to repeat the importance of reform. It’s been said by Chinese scholars and some officials many times, and I hoped to move it forward via the voice of a foreigner. About twenty foreign experts from sixteen nations spent two hours at the meeting. I was the only Japanese. Unfortunately, the translating took too much time and I didn’t get a chance to speak. The director of SAFEA, Zhang Jianguo, told us that we would go to the Great Hall of the People. And then Xi would listen to our advice. This news was very exciting. I decided to think over what I wanted to say. I gobbled my lunch and thought about my points. For years, I’ve worked in the Chinese investment banking industry. The stock market has always been my focus. The market reflects both short-term and long-term structural changes in the economy. The biggest long-term challenges facing China are aging and urbanization, and Japan can offer experience and lessons on both. Japan has been a silver society for a long time and finished the urbanization process in the 1970s. Its policies on employment, affordable housing, education, annuities, and medical care can all be borrowed by China. Current China-Japan relations, however, make me sad. Despite the politics, bilateral communications should be enhanced, rather than halted. Widening the communication lines should be a wish of both peoples. It might sound naïve to say, but at this very important moment before meeting Xi, this topic was burning in my mind. At about 3:30 p.m., a bus took us to the Great Hall. After waiting for half an hour inside Xinjiang Hall, we walked into the opposite Fujian Hall, where Xi and other Chinese leaders greeted us. Surrounded by many reporters, each of us shook hands with Xi, while Zhang from SAFEA stood beside him making introductions. “I worked for CITIC Securities, for Chang Zhenming (chairman of CITIC Group) and Wang Dongming (chairman of CITIC Securities),” I said, figuring Xi might know these two men. “Is the headquarters of CITIC Securities in Beijing?” asked Xi. “The registered headquarters is in Shenzhen, but most of managers are in Beijing,” I said. “Good,” he answered in a booming voice, and smiled. After shaking hands, we lined up for photos. Afterward, Xi took the center seat in the hall, and other party leaders, including Ma Kai (state councilor), Zhao Leji (head of the party’s Organization Department), Dai Bingguo (state councilor), and Li Zhanshu (director of the General Office of the Central Committee), sat by his side. “I spent seventeen years working in Fujian, first in two cities, and then as the provincial governor,” said Xi. He pointed to the decoration on the wall and introduced to us the most famous scenery in the coastal province. I started to get nervous. Since we were told that only four of us would have the chance to speak, should I raise my hand now? While I was hesitating, the Spanish expert who is co-president of the China Europe International Business School, started talking. There was a microphone in front of him. I took a look and found four experts with microphones and speech scripts on the table. It was all arranged. After the speeches by foreign experts, Xi told the members of the audience that the goals listed in the report of the 18th Party Congress were not hastily determined by a few top leaders, but were the result of incorporating advice and opinions from a lot of people within or outside the party. Now, the task was how to resolve current problems while keeping those goals in mind. One key was for countries to foster peaceful world development, to which China would contribute. “[Meeting] our goal eventually will rely on the efforts of us Chinese, but needs support from people around the world,” Xi said. He added that while pursuing national interests, China had to respect the interests of others. And he said its rise was not a threat to other countries, but an opportunity for them. China is both an advocate and a practitioner of win-win cooperation, he said. Xi said his remarks were his opinions, clarifications, and a declaration of foreign policy. After the meeting, Xi and other party leaders saw us off at the gate. Shaking hands again, I told him in Chinese that was touched by his remarks. China is facing more friction as a result of its growth, I said, and it’s important to clarify the nation’s policies. “Your Chinese is very good,” Xi said. “My parents worked in Beijing in the 1960s and ’70s, and I lived in Beijing, too,” I said. The meeting lasted one hour and twenty minutes, and the only speaker from China was Xi. I regret not having had an opportunity to make a remark, but perhaps it was better than for me to say what was on my mind, which might have caused him trouble. It was dusk, and Tiananmen Square was all lit up as we walked outside from the hall. As I felt the chill of Beijing winter, I reflected on the meeting with Xi with memories of old Beijing dancing in my head. I spent several years in the capital during the Cultural Revolution. Observing my friends, I knew perfectly well what a shock it could bring to children when all of a sudden their parents who were also high party cadres were labeled the offspring of counter-revolutionaries. I could only imagine what a scar such an experience would leave on a person. After decades working in cities and provinces, Xi is now China’s leader. He is mild, determined and carries the heritage of a revolutionary family. What did he really want to convey to we foreigners? I can summarize his speech with three points: China will continue reform and opening up, will contribute to the peaceful development of the world, and will never seek hegemony. As the world’s second-largest economy, China’s actions are closely watched by everyone, and Chinese people should also be clear about these principles when dealing with foreigners.